Stainless steel tables are durable, strong and hygienic - great for commercial and catering kitchens. Whatever kind of food you're cooking, you'll need somewhere to prepare all the recipes. 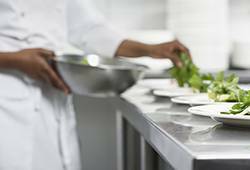 Having a clean and tidy surface is needed in every kitchen to get everything ready for service. Without a work table, where are you going to build a burger, chop veg or knead dough?! Like Benjamin Franklin once said "fail to prepare and prepare to fail"! Buy one and add it to your current commercial kitchen or why not buy several and set up a new catering kitchen? Just choose the size that's right for your space. Got a big event or need to prepare food fast? Pick up from our warehouse in York, North Yorkshire - or order before 2pm and you'll receive it the next working day (if you live in mainland UK, excluding Scottish Highlands).